This week's Faculty Spotlight shines on Dr. Marxa Figueiredo, who has been promoted to the rank of associate professor of basic medical sciences. A native of Brazil, Dr. Figueiredo joined the College of Veterinary Medicine in 2015. Dr. Figueiredo's career in her field began after she received her bachelor's degree in biomedicine from the Universidade Federal de Goias in Brazil. Then in 2002, she earned her PhD in cellular and molecular biology at the University of Wisconsin Madison. Additionally, Dr. Figueiredo completed postdoctoral training at the University of California at Los Angeles and served on the faculty at the University of Texas Medical Branch in El Paso before accepting her position at Purdue. As a member of the Purdue Veterinary Medicine faculty, Dr. Figueiredo has played an integral role in shaping the minds of PVM students. 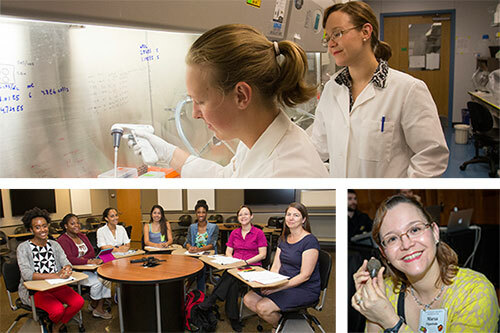 She has taught a successful Cell and Tissue Design course, and has trained PhD students, DVM students in the Summer Research Program, and undergraduate students in the Summer Research Opportunities Program at Purdue. She also participated on a team led by fellow Basic Medical Sciences Department faculty member Susan Mendrysa that created the new Post-Baccalaureate Research Education Program for Biomedical Sciences (PREP), which involves a partnership between the College and the Provost's Office. This revolutionary new program will contribute to enhancing diversity in the field of biomedical research. When asked about her interest in veterinary medicine, Dr. Figueiredo commented, "As a PhD, I am attracted to having a Purdue Veterinary Medicine career because of the strong focus of research here on animal health and on animal models for understanding cancer biology and musculoskeletal disease. The discoveries the faculty and students make can potentially benefit companion animals and humans one day," Dr. Figueiredo said. Her passion for the field shines in her work both inside and outside the classroom. In addition to her involvement in the field of biomedicine, Dr. Figueiredo enjoys spending time with her family and her two daughters. She also has a passion for exercise, specifically dance fitness programs such as Zumba and Piyo. As for advice for future students of veterinary medicine, Dr. Figueiredo said, "Get research experience early and often if possible in college to see if you like it and always believe in yourself. Find mentors who are positive and kind and who will nurture your career." Congratulations to Dr. Figueiredo, one of the College's ten 2017 promoted faculty members.